The Best July Weather in Generations for the Northwest? 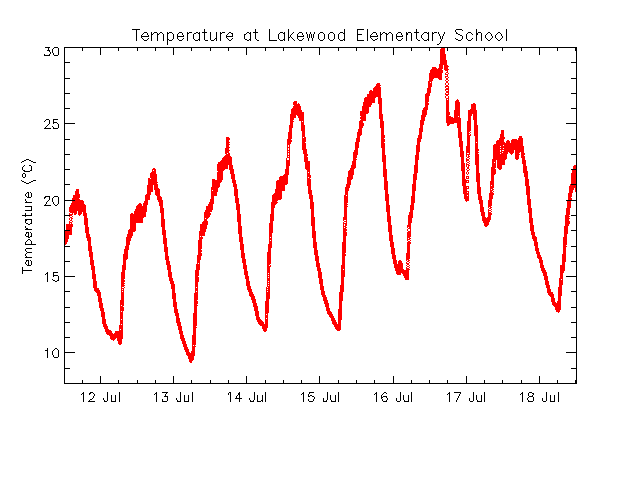 July 2013 was probably the best Northwest weather in a half-century or more. Perfect temperatures west of the Cascade crest, lack of rain, plenty of sun...this month had it all. And we broke or tied some amazing records this month: be prepared to be impressed. I had to wait until this evening to be sure about several of these records, as a band of convective showers moved northward across the region during the afternoon and early evening hours. But now the story is clear. Perhaps the most extraordinary occurrence was the aridity of the northern Washington coast. Quillayute (near Forks) tied the driest month on record set 124 years ago in 1889 (.01 inch). The precipitation record I am referring to actually combines two stations because of a move. From 1883-1966, the station was at Tatoosh Island and from 1966 on a Quillayute. This is a very big record to tie. No one alive today has experienced such dry conditions on the coast. What about Seattle? The airport only had a trace of rain, the driest since 1960. There are plenty more of these, but you get the point. To get some perspective on this, here is a map (from the Western Region Climate Center) showing the percentage of normal precipitation for July 1-30, 2013. The Northwest was VERY dry, with the coastal region experienced 2% or less of normal. Ironically, it has been far wetter than normal in Arizona, New Mexico and much of Nevada! But what about July temperature? How many ways can you say perfection? Let's start with Seattle-Tacoma Airport. In the figure below the red line is the average high and blue line is the average low. Only about a handful of days were below normal and only two days failed to reach 70F. No days in the 90s. Pasco and Spokane? Same story, but add 10-15F. Warmer than normal with very little cool weather (see graphics). Obviously, the drought and warmth east of the Cascades has a down side, with a substantial fire threat (essentially we had mid to late August ground/fuel moisture in late July). A more comprehensive view of the temperatures are found in the difference of the monthly average temperatures (through July 30) with normal conditions (climatology)--see graphic. West of the Cascade crest the temperatures were near normal (i.e., near perfect), but warmer than normal conditions were found to the east. Southeast Oregon was very hot (and dry). 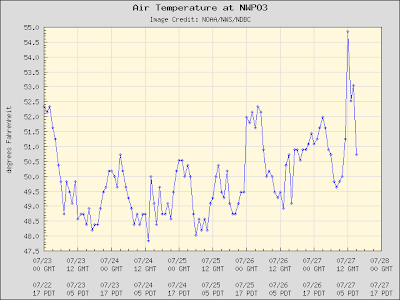 I have looked through the Sea-Tac records of the past few decades and could find no July as comfortable as July 2013. This is surely the best July on record for most of you. We have a few days of cooler than normal temperatures and a higher chance of precipitation ahead of us because of an upper level trough (particularly wet over eastern WA and the northwestern corner of the State). But it should warm up later in the weekend. Here is the latest Climate Prediction Center 6-10 day forecast. Above normal temperatures over our region and below normal precipitation over the western side. Enjoy. You will be telling your grandchildren about this July one day. 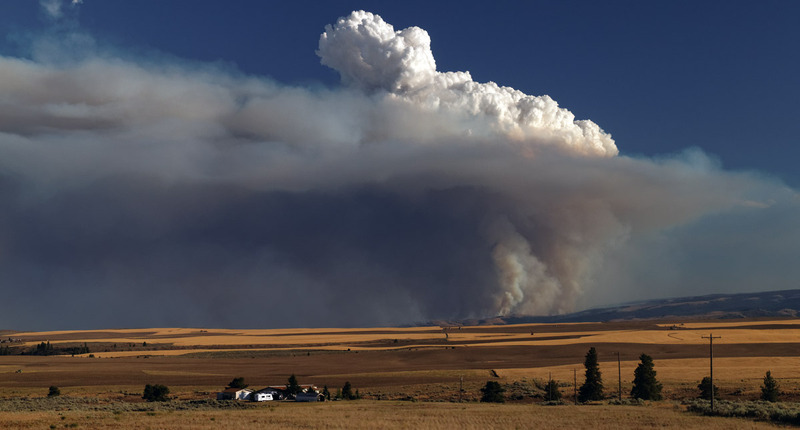 During the past week two major wildfires have initiated and spread to thousand of acres here in the Northwest: the Mile Marker 28 fire near Satus Pass in south central Washington and the Colockum Tarps fire south of Wenatchee. And meteorological issues threaten to make the fire situation worse at the end of the week. Sunday morning's visible satellite image (at 8AM) shows lots of smoke in eastern Washington (mainly from the Satus Pass fire. The Colockum Pass fire increased in size during the day (see satellite image around 7 PM Sunday below). Some thunderstorms developed over the north Cascades and if you look closely you can see a cumulus cloud in the middle of the Colockum Pass smoke plume. 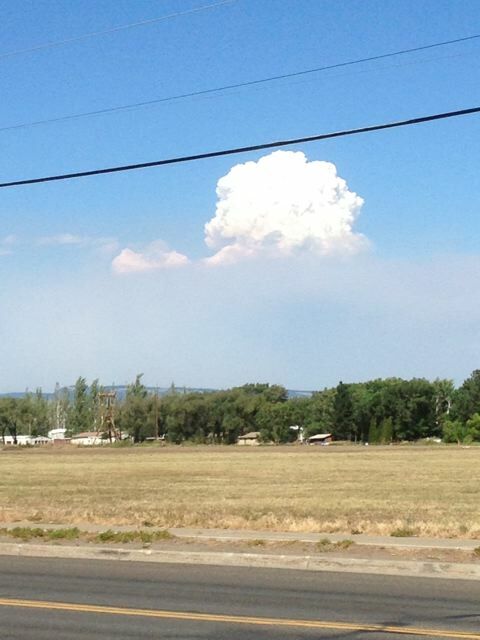 The heat was sufficient to cause the air to become highly buoyant, producing a tall cumulus cloud-- called pyrocumulus. 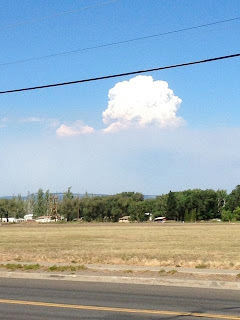 Lori and Don Robbins sent me a picture of the pyrocumlus from a vantage point in Ellensburg. And amazing picture from"Sooperfly". The smoke rises to a level at which it is no longer buoyant and spreads downwind. 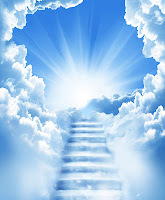 The cumulus cloud, with extra warmth from the release of latent heat (heat is released as water is condensed) can rise even higher. A big issue for the Colockum fire (and to a lesser degree the Satus Pass fire) has been the strong westerly winds pushing eastward down the Cascade foothills on Sunday, forced by a strong pressure difference across the Cascades. This strong winds and large pressure difference are associated with the cooler air that has moved into the west side of the mountains. Here are the maximum winds for the 24h ending 9 PM Sunday. Lots of locations getting to 20-30 mph, a number reaching 30-40 mph. Not good for fighting fires. The UW WRF model predicted the strong winds on Sunday (see graphic for 5 PM), but forecasts a major weakening on Monday...which should be a boon to the firefighters. But a bigger threat is on the meteorological horizon...lightning caused fires. 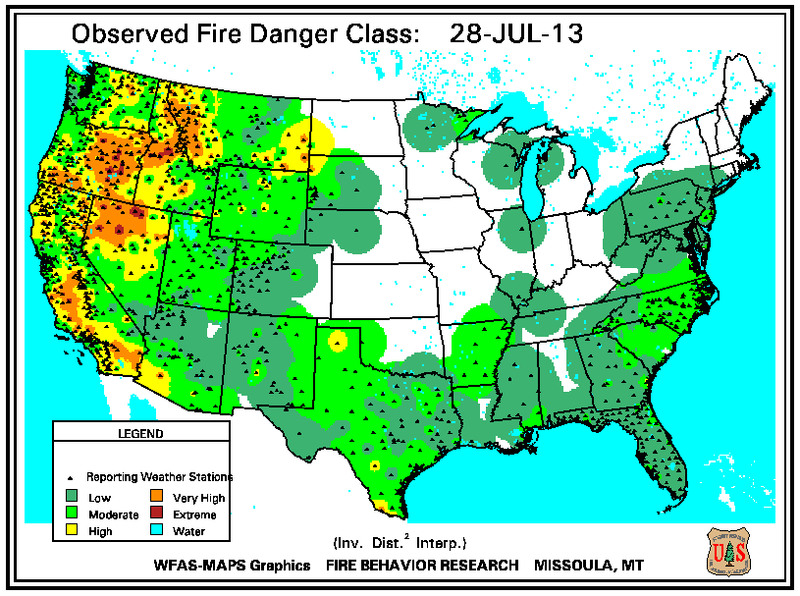 Today, there was quite a bit of lightning in the northeast Cascades and the Okanogan--did they initiate any new fires? But more ominously, the weather situation will be very favorable for thunderstorms during the middle and end of this week. Such lighting, plus the dry conditions of the "fuels" at the surface, will produce a substantial threat of new wildfires. Here is the current fire danger map from the USDA Forest Service. Eastern Washington has a substantial risk, but eastern Oregon and Idaho are even drier. While much of the west side of the Pacific Northwest warmed into the 80s and east of the Cascades into the 90s and higher, one area has gotten cooler and cooler. Ground zero for chilling out? Portions of the Oregon coast. And strangely, they have cooled while the rest of us have warmed and will warm as the weather cools over the interior this week. Weird weather here in the Northwest! 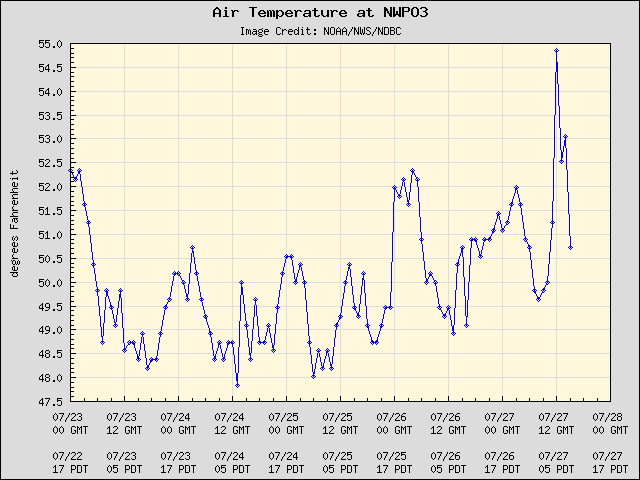 Consider the temperatures at Newport, Oregon, on the central Oregon coast (station NWP03, see map below). Temperatures had fallen there over the past 10 days to highs of 50-52F, but started warming a bit (to a torrid 55F) yesterday. I might note that while the 50s were observed along the coast, 90s were only a short drive away to the east in the Willamette Valley! 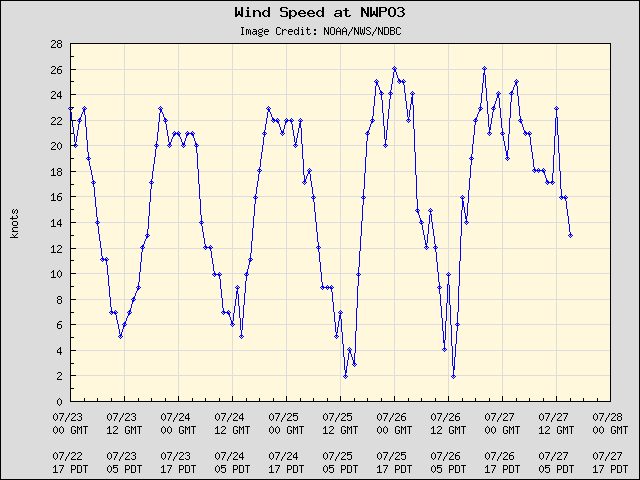 During that period it was not only cold, but windy at Newport and other coastal locations, with winds increasing to over 24 kts! The wind chill temperature is down in the mid 40s. Feels like winter in summer! A hint of what is going on is found from the latest sea surface temperature chart (see below, in °C, purple is very cold, blue is cold, then warming with green, yellow to red). The coastal Pacific is really cold--at 11 C (about 51F) and cooler. At some locations the coastal Pacific has dropped to around 47F! 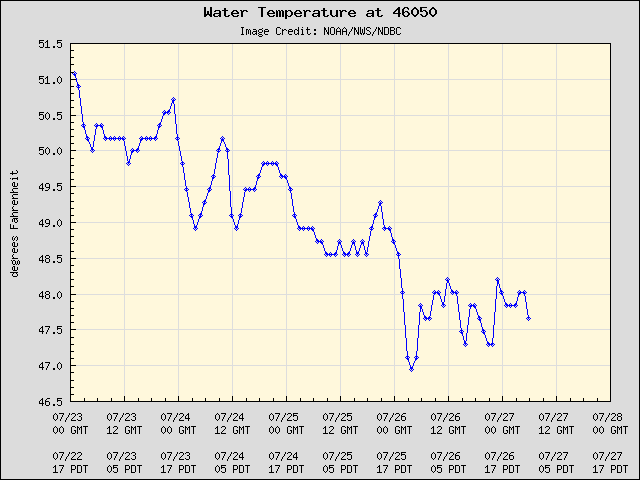 In fact, looking at the measurements at some coastal buoys along the Oregon Coast (46050, 46015, see map and plots below) the water temperature has gotten cooler and cooler? Why? Strangely enough the cooling is directly associated with our nice weather in the interior. 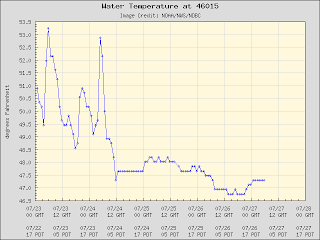 The warming interior caused pressure to fall relative to the high pressure over the ocean (the East Pacific High). The resulting pressure differences produced day after day of strong northerlies along the coast (thus the origin of the powerful winds). The following forecast of sea level pressure and winds from the UW WRF model for a few days ago illustrates this. But as the interior cools and an upper trough moves in during the next few days, the winds should relax along the coast and the upwelling should weaken. So strangely, it will warm at Newport and other coastal locations. Secret Revealed: The Northwest Has the Best Summer in the Nation. But Why? A few days ago, a well known ratings group found Seattle to be the NUMBER ONE city in the U.S. for pleasant summer weather, while Portland followed in second place. Even major newspapers like the Los Angeles Times seemto agree. A table from the authoritative Sperling report says it all (see below). With comfortable average highs in the mid-70s, sleep-friendly lows in the lower fifties, and low dew points and relative humidities, Seattle is meteorological heaven during the summer months. But the Sperling report missed some critical meteorological and other information that makes Northwest summers even closer to heaven on earth! (1) Being relative far north we have the longest days in the lower 48 states. So there are more hours to enjoy perfect weather. Finish work at 6 PM? No problemo...plenty of time to have fun outside. (2) When we do have one of our "heat waves", it is nearly always DRY HEAT with low dew points. Why? Because to get really warm here, you have to get offshore, downslope flow. Air coming off the cool Pacific is obviously not going to give you a heat wave. The interior of the Northwest is dry and when the air sinks along the western slopes of the Cascades it is compressed by higher pressure and warms. It is virtually IMPOSSIBLE to get a major heat wave (temps above 95F) with high humidity as they get in the eastern two thirds of the country. 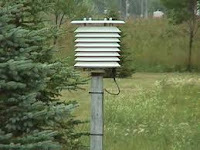 (3) Other parts of the country can get severe thunderstorms during the warm season. That is extremely rare around here because of the cool Pacific and low dew points we enjoy. (4) We do not get hurricanes or tropical storms like the eastern U.S. Again, thank the cool Pacific Ocean. (5) We have practically NO RAIN in the summer. Really. Seattle is drier than Phoenix in July. So you can enjoy perfect temperatures without the inconvenience of even thinking about an umbrella or rain gear. 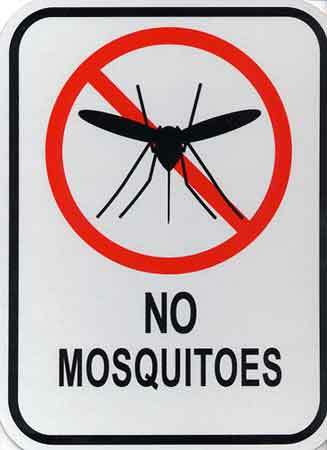 (6) We have far fewer mosquitoes and biting flies that the eastern U.S. ? (probably the lack of rain contributes to that!). And did I mention a lack of poisonous snakes! (7) Seattle has great visibility in the summer. This is because the air is relatively clean after passing across the Pacific and our low humidity (which prevents particles that absorb water vapor from growing). And we have great things to see as well, like the Cascades, the Olympics, Puget Sound, and Mt. Rainier. (8) If you don't like the perfect weather of the western lowlands, a short drive can give you something a bit different (but still good!). Head to the coast if you would like to take 10F off the temps and enjoy the sound of a few fog horns. 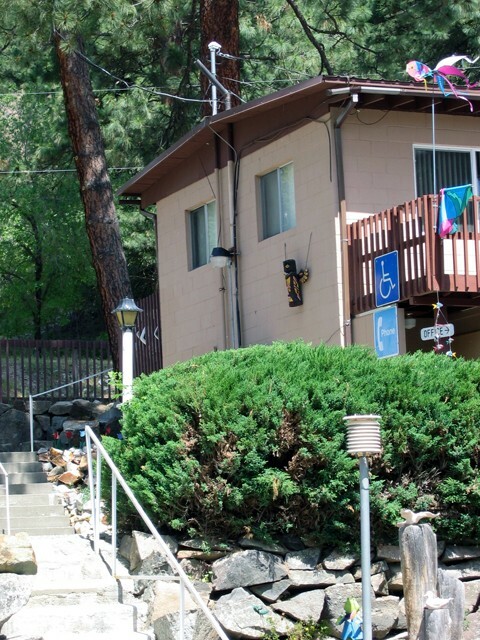 Cross the Cascades for that dry, warm sauna effects at Lake Chelan or other locations. Perfection plus choice. (9) In the Puget Sound lowlands escape from heat is only a short drive or bus ride away. The Sound is still around 50F during the warmest spells and the beach areas can be in the 60s, while 80s or warmer are found a short distance away. (10) It is hard for us to stay too hot for too long. The NW has a natural air conditioner system. As temperatures warm, pressures tend to fall over the hot interior. Eventually the pressure difference between the cool (and higher pressure) Pacific and the interior gets so large that marine air surges in. And profound relief follows. Virtually guaranteed. (11) And even when we have our biggest heat waves, nighttime temperatures are still reasonable. Consider the WARMEST DAY IN SEATTLE HISTORY, when temperatures at Seattle Tacoma Airport climbed to 103F. The temperature dropped to 71F that night! A bit warm, but still ok for sleeping if you have a fan. Folks on the East Coast call that a comfortable night, particularly since our dew points were modest. Yes, we live in as close to summertime meteorological nirvana as is available on this planet, a fact the Seattle Chamber of Commerce should use to our great advantage in the tourist trade. And there is another deep secret: because of our proximity to the Pacific the impacts of global warming on local summer weather will be far less than in most areas of the country. We will remain meteorologically blessed. Are Nighttime Heat Waves Increasing in the Northwest? On Saturday, the Seattle Times ran a front page story about how nighttime heat waves are increasing here in the Northwest during the summer. Based on an article in the Journal of Applied Meteorology and Climate, the story was repeated by media outlets throughout the region. But the more one looks at these results, the more questions come to mind. This blog will highlight some of my concerns. Before I go further, let me note the region they considered was western Oregon and Washington. Interestingly, the authors found no trend in the extremes of maximum temperature, but only in minimum temperature. That seems a bit odd in itself, but some studies have suggested this is a general finding (more increase in min than max temps), with the idea that more cloud cover or other effects might be the cause. Around here, daytime warming is what really put folks under acute heat stress and the "heat waves" examined in this study were associated with nighttime temperature falling to roughly the mid 60s or more for three days or more. Not very dramatic and wimpy by heat wave standards for the rest of the country. 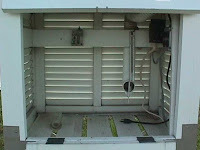 But the lack of correspondence between serious daytime and nighttime heat waves IS concerning, since most major heat waves around here (like July 2009) are observed in both maximum and minimum temperatures. There is a reason for that...our biggest heat waves are associated with strong offshore flow and subsidence down the western slopes of the Cascades, and this phenomenon tends to raise both maximum and minimum temperatures. There really seems to be a sudden increase in heat waves around 1990. That is why their paper and Seattle Times are talking about a trend in heat waves. Why would heat waves rev up in the years around 1990? Such a variation is not consistent with human-caused global warming, because that the warming increases slowly and would not start abruptly like shown in this figure. Natural variability can cause a sudden warming, but the big Kahuna of multi-decadal variability around here, the Pacific Decadal Oscillation (PDO), switched phase from cold to warm around 1975--which doesn't fit this figure. So we are left with finding the origin of the sudden increase in nighttime heat waves around 1990. To explore this issue, I started playing around at the wonderful web site supported by the Office of Washington State Climatologist (OWSC) that allows you to plot temperature from stations around the region. And as I plotted station after station a disturbing pattern was apparent: many stations showed abrupt temperature jumps, from one plateau level to another around 1990. Let me show you a few examples, displaying summer minimum temperatures. Try to ignore the red lines, the trend line for the entire period...really is useless. Try covering the figures before and after the jumps..that really drives the point home. 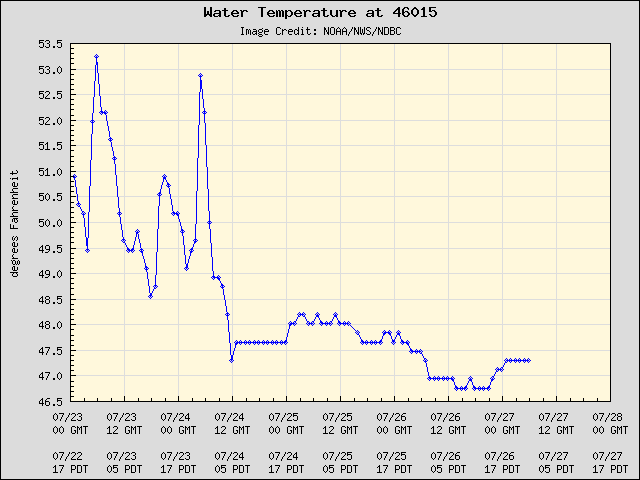 First, there is McMillin Reservoir near Tacoma..big jump by1-2F around 1986. Or Astoria, a jump around 1989. Everett, a jump in the early 1990s. Forks moved to a new, higher plateau around 1989. So what was producing the jumps to higher plateaus? 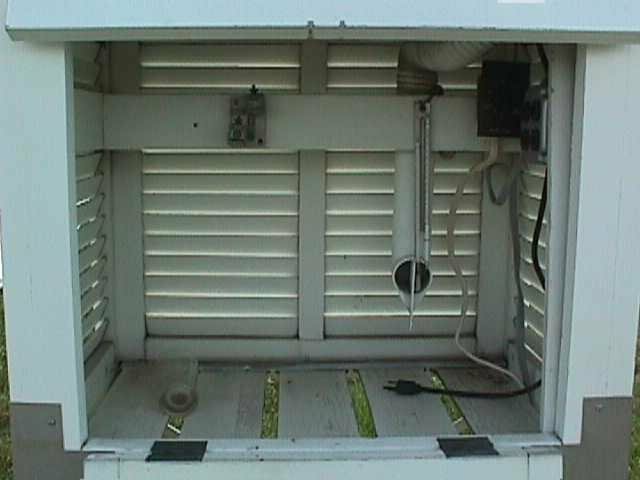 Well, it turns out that NOAA made a major change in temperature sensors, from old style alcohol/mercury thermometers in white slotted shelters to electronic sensors called MMTS in plastic housings during the late 1980s and early 1990s.. Here is how they look. and this one in Conconcully, above hot rocks! A number of studies have shown the buildings and urbanized settings tend to influence the minimum temperatures more than the maximum temperatures. For example, rocks, concrete and structures tend to absorb heat during the day and release it at night. And the atmosphere is generally more mixed during the day, so local effects tends to be lessened. NOAA converted many of the climate sites to MMTS between 1985 and 1995. And my brief examination of the record from each station suggest that many of the jumps were associated with the conversion to electronic thermometers. For example, take McMillin Reservoir. The official NOAA metadata (metadata is a description of sensor changes and moves) shows the conversion to MMTS in 1986. For Everett 1991-1992. And there was another sensor change at the airports to the HO83 sensor, which had its own biases. Further proof of the MMTS conversion issue has been noted by Mark Albright, past state climatologists. He compared McMillin Res against Olympia since Olympia didn't undergo the MMTS conversion and is only 20 miles SW of McMillin Res. 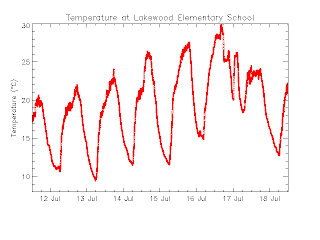 HE selected 2 years prior to the discontinuity and 2 years following the jump in temperature at McMillin Res for July. In 1984-85 McMillin Res and Olympia were both equally cold in July. Something had changed by 1990-91 to make McMillin Res +2.5 deg F warmer than Olympia. Several days with minimum temperatures in the mid to upper 60s. But the maximum temperatures are only in the seventies and light rain was observed. During the 3-day "heat wave" of 21-23 July 2007 at SeaTac Airport, rain fell each day totaling 0.60 inches and the high temperature averaged BELOW NORMAL 72 degrees. The average high temperature at Olympia was an even cooler 71 degrees. This is no heat wave. I want to be careful here--my study was a brief one. But I believe there is real reason to wonder whether this sudden nighttime "heat wave storm" is real. And to assume the increased frequency of nighttime heat here in the Northwest is due to anthropogenic global warming is triply doubtful. Mankind will cause substantial warming of the planet later in this century...but I suspect that this nighttime anomaly has a less profound origin. Day after day we have experienced the same pattern of stratus developing overnight west of the Cascade crest, with clearing during the morning. But this morning we had "superstratus": thicker, slower to burn off, and accompanied by fog and drizzle in some locations (like north Seattle!). The enhanced stratus this morning was associated with stronger onshore flow at low levels, with a deep marine layer capped by a strong inversion (see plot at Quillayute Washington, line on right is temperature, on left dew point; when the lines are on top of each other the air is saturated). The vertical coordinate is height (in terms of pressure); 850 is roughly 5000 ft. Air is very dry above 925 hPa (about 3000 ft). It is fascinating to watch the stratus burn off using high-resolution weather satellite imagery. One thing we learned from the satellite pictures is how stratus and fog burns off: from the edges. Let's watch it happen today (Saturday). Let's start Friday afternoon at 4 PM, when the stratus of the previous day had burned off. Plenty of low clouds offshore! 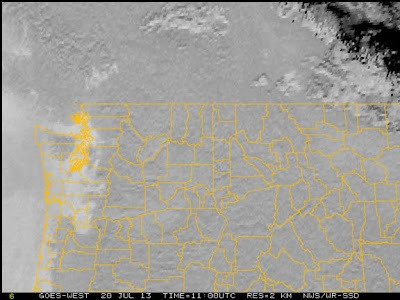 By 8 PM, the low clouds had begun to move inland (look carefully around Hoquiam and the western Strait of Juan de Fuca). The images you are looking at are called "visible" imagery--it is what you would see from space. The trouble is that visible light is not available during the night and infrared imagery (that is good 24-h the day by looking at the temperature of the emitting surface) is not very useful at night for low clouds (since they have a similar temperature to the surface). No worries! By combining a number of wavelengths, NOAA has developed what is known at "fog imagery" that can show the fog even when it is dark out. Here is an example for 4:00 AM. If you look carefully, you can see the low clouds has spread over the western lowlands. Extensive low clouds are confirmed by the visible imagery at 7:30 AM---coverage is pretty extensive. Now let's watch it burn off. By 9:30 AM, the low clouds were pulling back from the Cascade valleys. 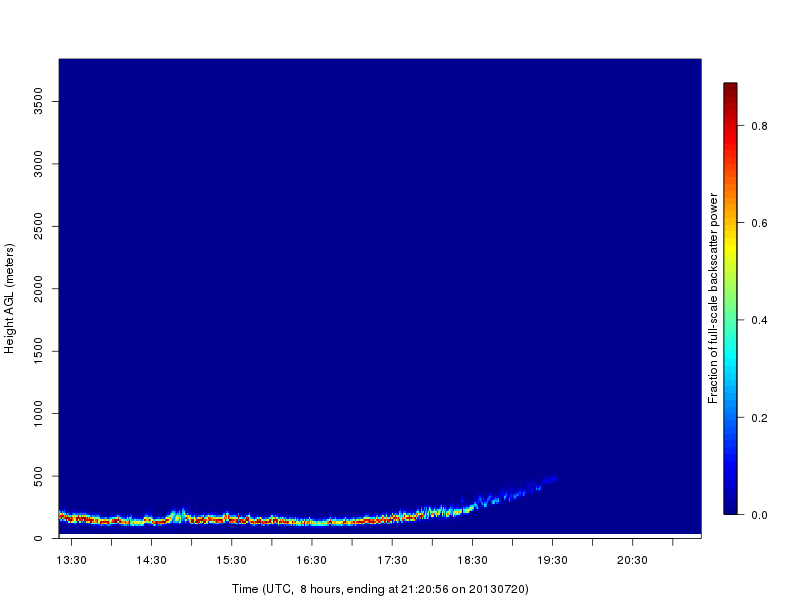 And then a rapid pull back by 1:30 PM. This is hours later than yesterday, the product of the deeper marine stratus/fog layer. So stratus/fog burns off from the sides. In addition, there is a tendency for the base of the fog and stratus to lift, as some solar radiation gets through to warm the surface. Meteorologists have a fancy device called the laser-ceilometer that can measure the base of clouds by reflecting a laser beam off of them. The UW got some surplus ceilometers from the National Weather Service and have one running in real time (and viewable on the web). Here the latest graphic...you can see the base of the low clouds rise and weaken in time. Another perfect weather day in meteorological paradise. Nearly every summer day Northwest temperatures follow a familiar routine, with temperatures hitting a minimum around 6-7 AM and rising until roughly 5 PM, followed by falling temperatures during the evening and morning hours. But something very different hit the western suburbs of Victoria B.C. Wednesday morning, with temperatures rapidly rising around midnight. How could this be? at the typical times (the big tick marks indicate midnight). But something weird happened early on the 17th. 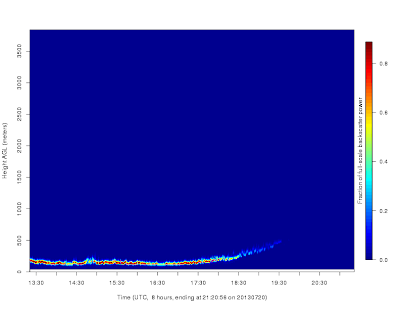 The temperature rose right after midnight, and then fell again. Strange behavior. Here is a plot of the temperatures and winds at midnight on Wednesday around Victoria...nothing too strange. A lot of temperatures in the upper 60s. (circles indicate calm, lines with pennants are winds). But two hours later at 2 AM something weird has happened...temperature zoomed up into the mid to upper 70s in the western part of the city, with one site hitting 79F. The warmth is explained by the winds. While most of the city had light winds, westerly winds had pushed into the eastern suburbs. Such flow is descending off the terrain to the west of the city, being compressed as it sinks and mixing down warmer air down from aloft. Here is a terrain map around Victoria to give you a better idea of what I am talking about. 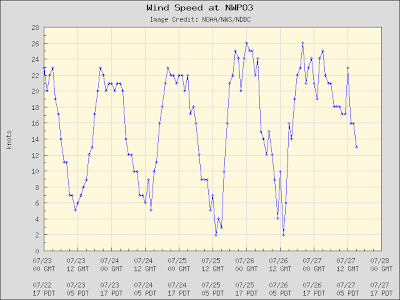 A few hours later the the westerly winds weakened and the temperature dropped to levels similar to the rest of the area. As long as I am talking about anomalies....it has been quite dry around here, even for July. So far we have only had a trace at Seattle-Tacoma Airport (a trace is less than .01 inches). If we get no more precipitation for the rest of the month there (a real possibility), we would enjoy the driest July since 1960. You will tell your grandchildren about this one day. And another big meteorological event happened yesterday....the snow finally melted out at Paradise Ranger Station on Mt. Rainier (see graphic). According to Mark Albright, past state climatologist, over the past 30 years, the median melt-out date at Paradise is 11 July. (The mean melt-out date is slightly later on 15 July.) During the first 15 years of operation from 1981-1997 the mean melt-out date was 10 July. Since then the mean melt-out date has moved 8 days later to 18 July over the 15 year period from 1998-2012. Over the past 5 years (2008-2012) the mean melt-out date has been 2 August. The earliest melt-out was 5 June 2005 while the latest melt-out was two years ago when the snow pack didn't melt out until 25 August 2011. 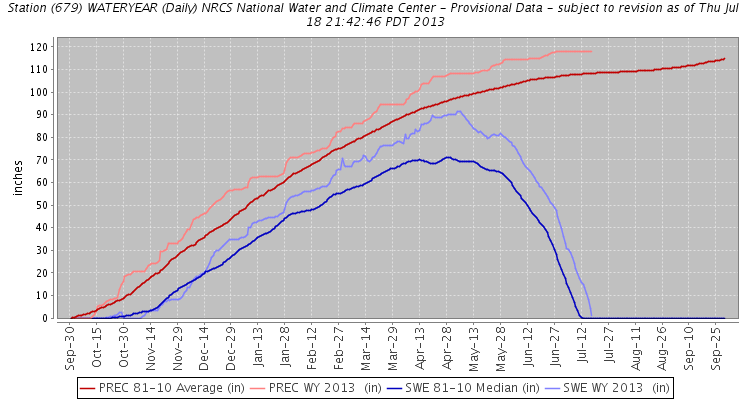 Bottom line: the Cascade snow pack is NOT melting out earlier during recent years. Why so few big thunderstorms in the Northwest? Concrete-Cracking Heat Wave: How Unusual Was It?